(3) Underneath all the blasts and howls there lurks a promising industrial and/or dark ambient band. Not to undermine or downplay Papacy’s potency as a teeth-baring black metal act, but one really does get the feeling that, together with the aforementioned Rise of the Liar, Papacy mainman Stressor might very well have reached peak blackness with Iron King. Stylistically similar to Rise of the Liar, though with a somewhat more crusty veneer, Iron King is a grimy, caustic effort is perhaps the sonic equivalent of being dunked head first in a barrel full of tar, medical waste and pine nettles. 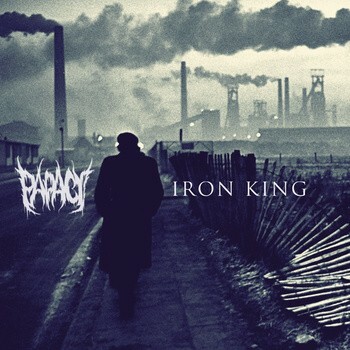 Unless you have a proclivity for music that breaks bones and skewering psyches, there is nothing pretty about Iron King. With its depiction of industrial filth and working class grit, the album cover looks exactly the way the album sounds. While the black metal elements take precedence—searing rasps, eerie melodies and near relentless blasting prevail throughout—the album seems to possess the same spirit of human frailty as its predecessor, though it has to be said that the brief moments of respite (e.g. the industrial outros of “Valancia” and Sacrament”) are used even more sparingly this time around. This does make the album a tad lop-sided in terms of the light-and-shade interplay, which is frustrating because one really gets the sense Stressor can concoct a stellar blend of industrial grind and post-rock-y moodiness if he wants to. These moments help offset the bleak minimalism of the guitars which, together with the equally monotone percussion gives the album a vibe that is blacker than soot. There are a few exceptions, like the somewhat adventurous thrash/crossover riff that starts rattling the BM foundations early on in “Dust of Eden” and the more rhythmically intricate combo of “Sun Glare”/”The Silence of Man, The Motion of Wheels,” helping to imbue even the most ferocious moments with a fleeting sense of fun. Essentially coming off as Rise of the Liar Part II, though with a slightly less pronounced sense of dynamics, Iron King is a no-nonsense slab of blackness that should appeal to fans of early Krieg, Anaath Nathrakh, Ildjarn and maybe even Godflesh. It’s cold, stark and merciless yet quite listenable (that is, if you have a listening constitution of steel). It’s doubtful if Stressor would be able to take this blast-ridden sound to new heights given the sheer levels of extremity on display here, so it’ll be interesting to see where he takes the project from here. This entry was posted in Reviews, Unsigned Reviews and tagged Anaal Nathrakh, brutal black metal, Godflesh, Ildjarn, industrial, Krieg, Papacy.